Another night, another tough home loss. But there is reason for concern now. Last year’s Blackhawks were successful when the team got into rhythm, but because of injuries and suspensions the roster hasn’t been together yet. Unfortunately, coach Joel Quenneville cut his bench in half on Wednesday night and it cost him. Jack Skille and Viktor Stalberg, who have been great so far this season, didn’t play in the third period despite starting the game on the third line with Dave Bolland again. Instead, Bolland played between Patrick Kane and Patrick Sharp while Jake Dowell was between veterans Fernando Pisani and Troy Brouwer. Similarly, Quenneville started the game with rookie Nick Leddy skating with Duncan Keith while Brent Seabrook was next to John Scott. Nick Boynton was on the third pair with Jordan Hendry. Leddy and Boynton skated well (despite a Boynton penalty that led to the game-winning power play goal with under 30 seconds left), and Keith and Seabrook were solid as well. But Hendry and Scott, who skated 12:21 and 10:07 respectively, continue to look like fish out of water. Hendry could have been credited with an assist on Nashville’s second and third goals, while Scott’s passing has been suspect and his skating has made molasses look like Usain Bolt. While Quenneville’s history, and his roster use so far this season, shows that he overwhelmingly prefers veteran players down the stretch in tight games, the time has to be now that Leddy starts to see ice time in critical situations. Leddy led the team with five blocked shots and skated 19:50 against a tough division rival, but was on the ice with Hendry when the game-winning goal was scored. He is proving on a nightly basis that he’s ready for the big time, and neither Hendry or Scott has shown that they deserve crunch time minutes. Perhaps the bigger question is: What are Scott and Hendry even doing on the roster? Once Hjalmarsson gets back from his two-game suspension on Saturday, the Blackhawks will have seven defensemen on the roster. So far this year, Hendry has been a healthy scratch in three games (every one until Hjalmarsson was suspended on Wednesday night). Meanwhile, Scott has been noticeably bad on almost every shift. Breaking down the roster dynamics shows that Keith, Leddy and Hjalmarsson can all move the puck well (and Campbell as well once he’s back from injury). Seabrook is the top physical force on the blue line in Chicago, but Boynton is physical as well. If you ask the NHL, Hjalmarsson is “too” physical, thus his two-game vacation. Boynton has been better than both Hendry and Scott, and deserves ice time as the team’s sixth defenseman once the roster is back at full strength. But Scott, despite his enormous stature, isn’t really necessary. As we saw in the home opener, he can’t be physical if he’s laying on his back watching a winger fly by him. At the same time, Hendry hasn’t been effective enough to get on the ice when the Hawks have seven healthy/not-suspended defensemen. He isn’t overwhelmingly physical, and doesn’t handle the puck well; there is nothing special about Hendry’s game, and right now he’s making too many mistakes. 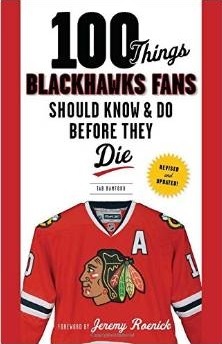 The big question moving forward for Blackhawks management is whether or not a kid from Rockford, perhaps Shawn Lalonde or even Brian Connelly, would be much worse than what they’re getting from Scott and Hendry? Boynton isn’t an 82-game player, and we’re seeing what playing with elite players like Keith, Seabrook and Hjalmarsson is doing for Leddy’s game. It might be time for the Hawks to look at their youngsters in Rockford for depth on the blue line. You can’t blame this loss, or any of the Hawks’ three losses in four games, on the goalie. Corey Crawford played a solid game on Wednesday night at the United Center, fighting off numerous really good chances. On the night, Crawford stopped 24 of 27 shots (.889 save percentage), but was active and stopped a lot of good chances. Jonathan Toews had a goal and an assist on the night, and Marian Hossa added an assist for his sixth point in four games this season. 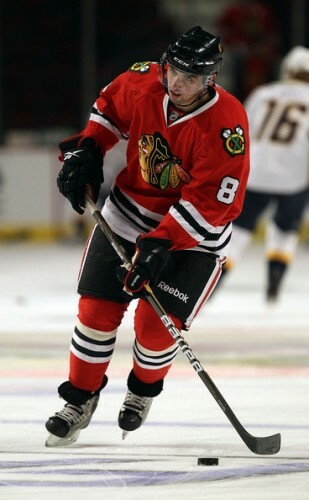 Patrick Kane scored his second goal in two nights to open the scoring on the night. I’m not sure what you’ve been watching, but Keith did nothing tonight and has been merely pedestrian this year. Playing over 30 minutes a night might have something to do with that, but he’s trying to be too cute at times. Forget about a repeat Norris……And Boland needs to wake the F up too. I’ve been watching Keith carry the blue line. Last year he skated over 30 minutes in 8 games over a full season. Tonight was his fourth in four games already this year. He’s the QB on the PP, the best PK guy, and skates against other teams’ top lines. Until the Hawks have someone competent on the 3rd pair, he’ll be skating over 20 minutes in the first two periods like he did tonight. He’s carrying a craptacular blue line. Now don’t get me wrong, Dunc is probably my favorite Hawk along with Hammer. But, 30 minutes a night or not, you have to admit Dunc has been underwhelming this year to date. I have yet to see him change a game. He just hasn’t found it yet. And that’s okay. But, I’m still not giving him a pass. And that competent third pair could take a step in the right direction if Q would stop healthy scratching Hendry and stick Scott up in the 300s. Can’t wait for Saturday……. Playing 32+ minutes will do that to you. We will tread .500 until Hammer and Campbell are the #2 pair, taking minutes from our top pair. Keith’s minutes right now are not sustainable. While awesome, his play will/has suffered as a result. Boyton has solidified himself as our 5th best defensemen and I hope Leddy keeps hitting the weight room because he simply isn’t strong enough. Yeah he can move the puck but excuse me but we need a guy to win the board battles and eliminate people in front. Leddy has potential but IMO he is a liability right now. Bolland has been so bad I wonder whats wrong with him. We have zero third/forth line scoring. Short bench means a very predictable result…….we looked tired in the third period. Find production in our final two lines, get our D healthy and playing appropriate minutes and the W’s will come in bunches. Right now it’s try and stay afloat………..
Agree about the third and fourth lines, but then why does someone like Skille not see the ice in the third? He’s been a great energy guy off the bench, has drawn a couple penalties and someone underneath it all, has a scoring touch. Some of the personnel decisions have been suspect, it’s not just the play. And I wonder if Bolland’s back is bothering him again……..
← Corey Crawford Gets Consecutive Starts: Goalie Controversy?